Blue Kyanite, Iolite & Zircon Gemstone Cuff Bracelet with White Water Pearls. Hand crafted in Italy by Ziio. 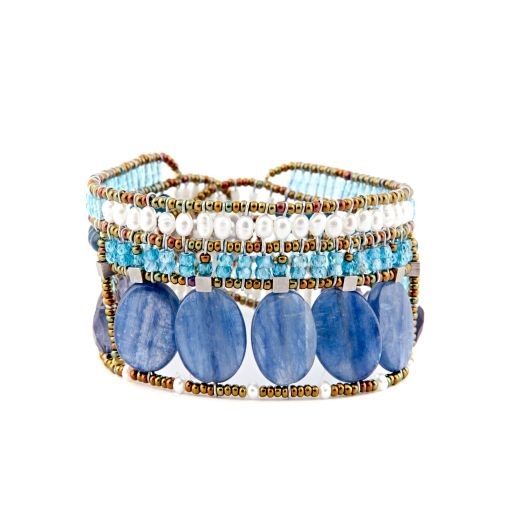 From Ziio's new Spring/Summer Collection the "Goiaba" Cuff Bracelet is done in Blue Kyanite, Iolite, Apetite & Zircon Gemstones. Accented with White WaterPearls and Murano Glass Seed Beads. On stainless steel wire with a Sterling Silver Button Closure. Width 1 1/2", Length 7" to 7 1/2" adjustable. Hand crafted in Italy.